At an open discussion on Friday, students argued that administrators had not sufficiently alerted faculty members and teaching fellows of the nature of the racially charged, emailed death threat that several hundred Harvard affiliates received in early October. The discussion in Phillips Brooks House, hosted by Dean of the College Rakesh Khurana, was the second open meeting on the threat that administrators had organized in less than a week. It drew roughly 20 students and a handful of administrators, including Dean of Student Life Stephen Lassonde, Harvard Foundation Director S. Allen Counter, and Director of BGLTQ Student Life Van Bailey. Faculty of Arts and Sciences spokesperson Colin Manning sat in the back. Several student attendees said all professors and teaching fellows, not just students, should have been notified of the threats through an official email from administrators in response to the incident. Khurana had sent College students such an email last Wednesday. Teachers could then have been a source of emotional support for undergraduates affected by the threat, the students at the discussion said. 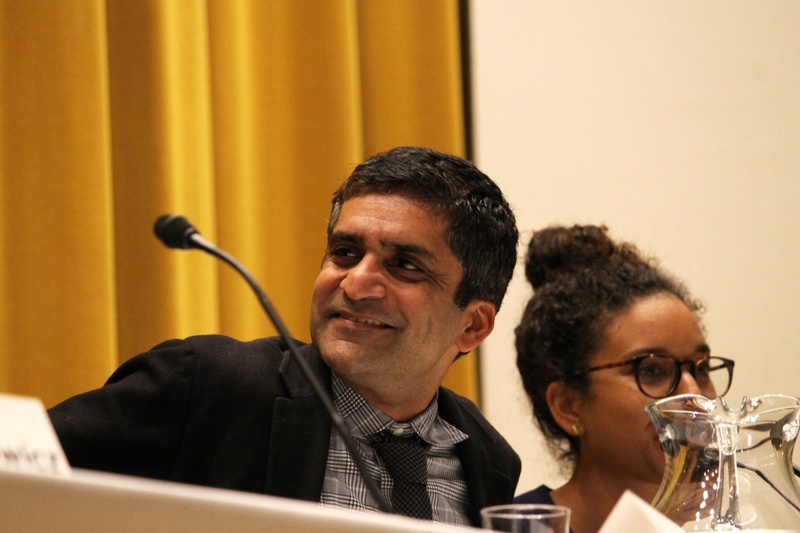 Dean of the College Rakesh Khurana, pictured here during a panel discussion in September, held an open meeting on Friday regarding administrative response to emailed death threats made against hundreds of Harvard affiliates earlier this month. Khurana explained that it is the role of the assistant College deans in each of the Houses—administrators formerly known as resident deans—to communicate with individual faculty members when students need accommodations in emergencies, but attendees said that depending on the deans was impractical given the large number of students affected by the threat. “It would be appreciated...in a situation in which it’s clear that a large portion of the campus population has been affected to send a few words to all teaching staff,” said Brett M. Biebelberg ’16, a representative for Quincy House on the Undergraduate Council who serves on the Campus Safety Committee. In response, Khurana said he would talk to FAS Dean Michael D. Smith about such a communication to teaching staff in the event of a similar emergency in the future with guidance for faculty on how to support those affected. During the meeting, Khurana also took questions on MessageMe, Harvard’s opt-in emergency notification service, and told students that it was not used after the threat because the Harvard University Police Department did not view it as imminent. The death threat prompted local law enforcement and the FBI to join Harvard police in its investigation. The police have since determined that the threat originated overseas.